Created to help traders to manage the risk. User introduces a positive and a negative floating amount. 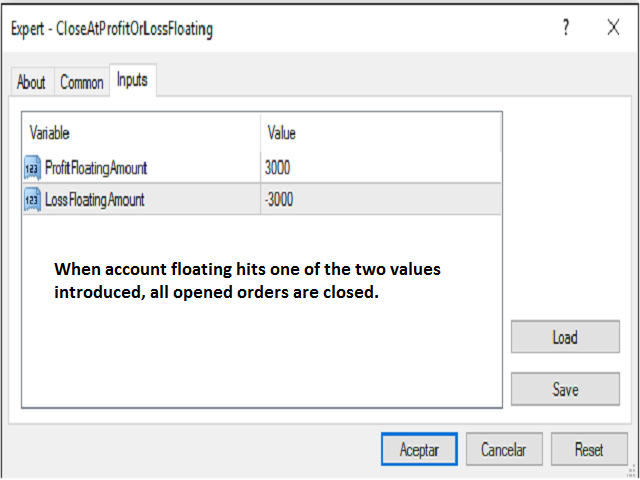 When account floating hits one of the two values introduced, all opened orders are closed. Of course, you can close your orders manually at any moment. You can change the parameters values stopping and restarting the EA. When EA is started, all opened orders apply to calculate the floating. ProfitFloatingAmount- a number greater than zero. It's the positive floating to close all opened orders. LossFloatingAmount- a number less than zero. It's the negative floating to close all opened orders. User introduces 3000 as ProfitFloatingAmount parameter and -2000 as LossFloatingAmount parameter. User has 4 opened orders with a current floating of 2500. Then, floating hits 3000 and all opened orders are closed. User has 2 opened orders with a current floating of -1000. Then, floating hits -2000 and all opened orders are closed.